Two months ahead of the IAAF World Athletics Championships, the “world’s fastest man” says the crowd at the Luzhniki stadium will be on the edge of their seats. In mid-August, Moscow will play host to one of the globe’s most televised sporting events – the World Championships in Athletics. 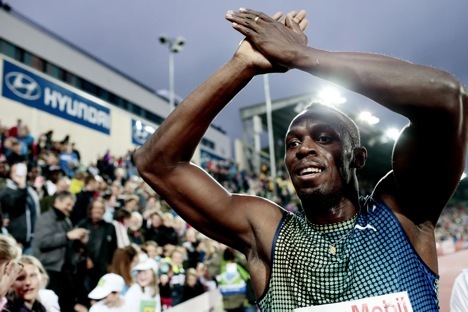 The biggest stars of track and field will descend upon Luzhniki Stadium, and world 100 metres and 200 metres record holder Usain Bolt will be among them. With just weeks to go before the Championships kick off, the six-time Olympic gold medallist sat down for an interview with R-Sport . Usain, you’ve never been to Russia, have you? I haven’t. So, I’ll get to know Moscow during the World Championships. Do you have any expectations of Moscow as a city? It’s hard to say. I don’t really know anything about Moscow, or Russia for that matter. And I’ve got no idea what the stadium is like either. One thing I do know is that it’ll be one of the season’s key races for everyone – we can’t wait. I’m sure everyone will try to come to the championships in peak physical condition. It’ll be a great battle. Everybody will be on the edge of their seats, you can count on that. You must know something about Russia? Erm... It’s difficult, I really don’t know anything. People keep asking me, and I honestly don’t know what to say. They tell me that I should say something about the beautiful women in Russia, but I guess everybody talks about that! Maybe you know something about Russian sport? Well, obviously I know the guys who compete in athletics. And Maria Sharapova! I know who she is, of course. Who do you think is the biggest threat to your throne right now? I don’t think about it. I prefer to focus one hundred per cent on my own game, making sure that I can get the best possible performance out of myself. I don’t want to look around and worry about who might beat me. There’s no need to make comparisons... There are quite a few guys who are looking good right now: Tyson Gay, Justin Gatlin, Christophe Lemaitre... Yohan Blake’s coming back from injury, so that should make this season interesting. But I’m really just trying to concentrate on my own game and what I’m capable of – so that I can get back to where I was. You are a star of the Summer Olympic Games. But what do you know about winter sports? Are you keeping up with the latest developments in the run-up to the Sochi Games? We know that you’re a big football fan. But we’re not sure which team is your favourite – Real Madrid or Manchester United. (Laughs) For me, Manchester United are the best. I started following Cristiano Ronaldo after he moved to Madrid from United. So yeah... it’s got to be United. You say that you keep in touch with Samuel Eto’o? We try to keep up with each other on the internet. His English is pretty bad, though, and I don’t speak French... But yeah, we’re friends. First published in Russian in R-Sport.